Gas Powered Games boss Chris Taylor says it's time to focus on other ways to save the beleaguered studio. 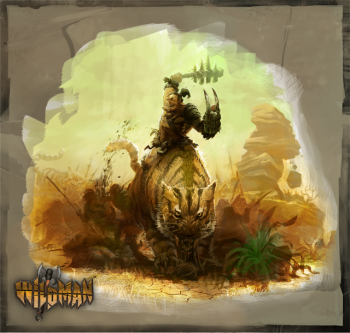 Gas Powered Games honcho Chris Taylor found himself in the unusual and unpleasant situation of having to lay off most of his employees mere days after rolling out the Kickstarter for his proposed action-RPG Wildman. With support from fans, he ultimately decided to continue the Kickstarter in an attempt to save the studio, but as funding faltered - with only four days remaining, it was less than halfway to its $1.1 million goal - he has now decided to pull the plug. "At this point, it makes sense for us to focus our attention on other ways to keep Gas Powered Games running. Unfortunately, we are unable to share any specifics in public," Taylor wrote in a Kickstarter update. "We are profoundly grateful to those of you who backed this project and Gas Powered Games. Your passion and hard work put us in a position to write this exciting new chapter in the history of GPG." Taylor said that further news will be posted on the Gas Powered Games website and recommended that gamers who want to continue following and discussing Wildman do so at the Gas Powered forums. He also expressed some optimism in the final Kickstarter video update that the game and the studio may yet be saved. "I've been working in the background to find other ways to keep Gas Powered Games running," he said. "If all goes well, which I think it will, I'll be able to give you all some great news in the weeks ahead." It's an unfortunate end to a promising Kickstarter and, quite likely, a once-prominent game studio, but perhaps Taylor will yet find a way to keep the lights on, and maybe even bring Wildman to fruition.